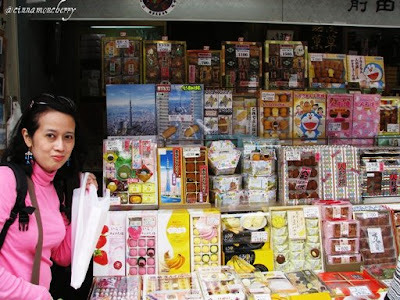 June 2011, my partner and I went to Asakusa. After visiting nearby temple, we were given some time to browse and shop. So many shops to choose. So many cute products, screaming, "Look at me! Bring me home!" The prices are fixed, no need to haggle. I think this is nice. Saves time. And the prices are reasonable. My partner got a yukata--casual kimono wear--for 1,780 yen. I got myself a cotton handkerchief with printed Japanese flowers for 120 yen. - Bring enough cash. Most shops do not accept credit cards. - If you are into buying small items from gashapon vending machines, stock yourself with 100 and 500 yen coins. - Bring a calculator with you and remember the exchange rate before you shop. - Some shops are cheaper than the others. If you really like something and you're not certain you're getting the best price, look around first. - Ask permission first before taking pictures of the wares. Some do not like people snapping pictures at their shops. - Use comfortable shoes, since you'll be walking a lot in this area, trust me!